Wahama sophomore Emma Gibbs (11) drives between Eastern seniors Jess Parker (left) and Kelsey Casto (32), during the Lady Falcons 64-46 victory on Thursday at Gary Clark Court in Mason, W.Va.
Eastern sophomore Whitney Durst (40) shoots a two-pointer over Lady Falcons Torre VanMatre (3), Harley Roush (24) and Emma Gibbs (11), during the Lady Eagles’ 18-point setback on Thursday in Mason, W.Va.
MASON, W.Va. — The Lady Falcons ended over decade worth of frustration by simply making the most of their free throw opportunities. 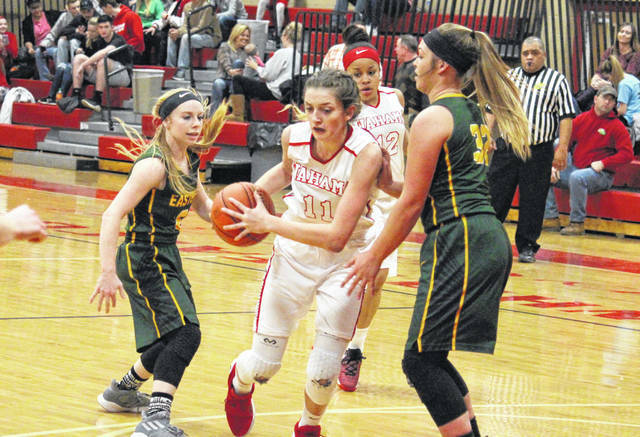 The Eastern and Wahama girls basketball teams have met at least once in a dozen consecutive seasons, and for the first time in that span, the Red and White have claimed victory. 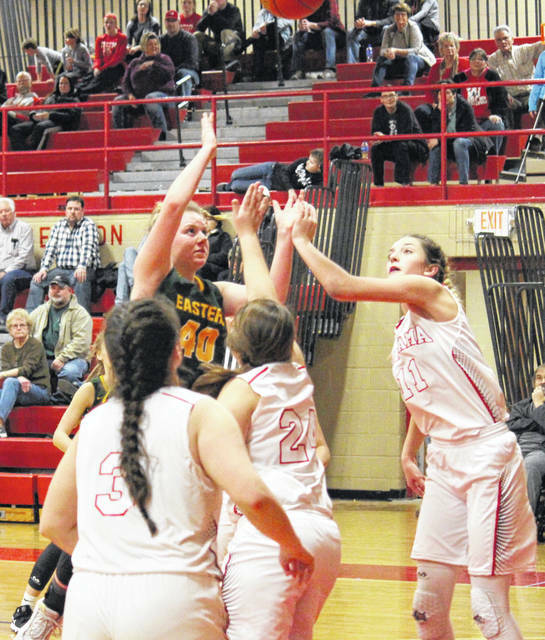 WHS — which dropped a 47-37 decision to the Lady Eagles on Dec. 6 in Tuppers Plains — sank 31-of-42 free throws on Thursday night at Gary Clark Court, propelling the Lady Falcons to a 64-46 victory over EHS in Tri-Valley Conference Hocking Division play. Eastern (9-5, 8-2 TVC Hocking) — which brought a four-game winning streak into the contest — led for the first and only time of the night at 1-0, 20 seconds into play. Wahama (6-7, 4-6) claimed the next five points, but the Lady Eagles tied the game at five with 3:48 left in the opening period. The Lady Falcons reestablished their lead, only to have EHS tie it up again, at 9-all, by the end of the quarter. The guests were held off the board for the first 2:45 of the second quarter, in which time Wahama stretched its lead to 17-9. The Lady Falcon lead grew as high as 14 points, at 27-13, in the stanza, and the hosts settled for a 28-16 halftime edge. Eastern cut the margin to single digits with a three-pointer to start the second half, but EHS was never closer. Wahama made 8-of-8 free throws in the third, and headed into the finale with a 44-31 lead. The Lady Falcon lead was at 48-31 within the opening 1:20 in the fourth quarter, but Eastern reeled off eight straight points and trailed by nine with 5:15 remaining. The margin was back to double digits just five seconds later, and Wahama sealed the 64-46 triumph by making 12-of-16 free throws down the stretch. After the game, fourth-year WHS head coach John Arnott talked about what the win meant to the seven Lady Falcons, who suffered a hard-fought two-point loss to Point Pleasant just 24 hours earlier. “It’s a statement win,” Arnott said. “We went to the locker room last night after we lost by two at the end of the game and I told the kids, ‘if you come tomorrow still thinking about what happened tonight, we’re in trouble. Tomorrow’s a new day, you have to come with some fire in your eyes and come ready to play,’ and we did. In the contest, Wahama was 16-of-46 (34.8 percent) from the field, including 1-of-3 (33.3 percent) from three-point range. Eastern also made 16 field goals, doing so in 70 tries for 22.9 percent, while hitting 4-of-22 (18.2 percent) long range shots. While Wahama shot 31-of-42 (73.8 percent) from the free throw line, Eastern was just 10-of-26 (38.5 percent), including 6-of-16 (37.5 percent) in the final quarter. The Lady Eagles won the rebounding battle by a narrow 45-to-44 clip, with a 30-to-15 edge in offensive boards. EHS committed two dozen turnovers in the setback, four fewer than the Lady Falcons. The hosts combined for 14 steals, eight assists and three blocked shots, while Eastern came up with 15 steals and 10 assists. EHS head coach Jacob Parker acknowledged that the charity stripe made the difference in the outcome. “We have been preaching foul shooting and making foul shots,” Parker said. “We didn’t quite capitalize as well as they did there. They’re a really good foul shooting team, and it seemed like they scored quite a few points from the line this evening. 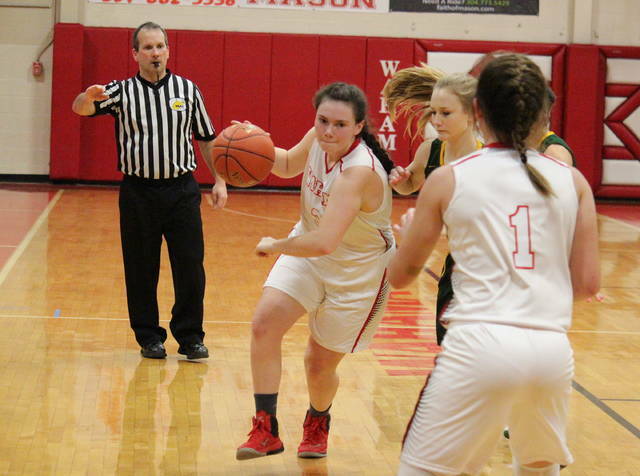 Leading Wahama, Hannah Rose scored 19 points and was responsible for the team’s lone trifecta. Emma Gibbs recorded a double-double of 18 points and 13 rebounds for the hosts, Harley Roush added 13 points, while Lauren Noble came up with eight markers. Torre VanMatre contributed four points, 12 rebounds and three assists to the winning cause, while Aleisie Barnitz chipped in with two points. VanMatre led the WHS defense with four steals, followed by Gibbs with two steals and two rejections. Alyson Bailey hit two three-pointers and led the Lady Eagle offense with 17 points and three assists, while also pacing the team’s defense with five steals. Jess Parker also made two triples for the guests, finishing with 10 points and a team-high nine rebounds. Next for the guests was Sydney Sanders with six points, followed by Whitney Durst with five. 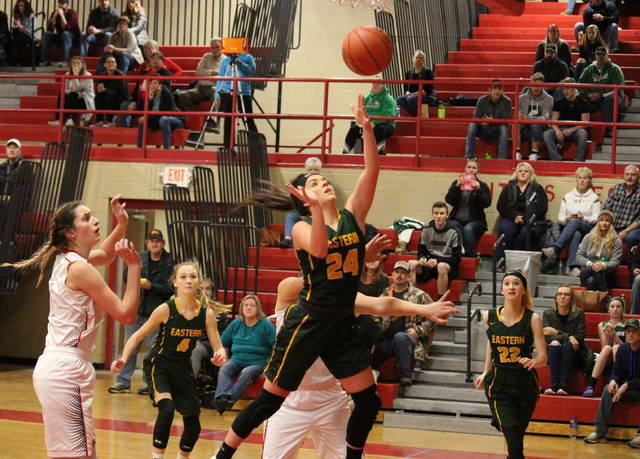 Kelsey Casto came up with four points and eight rebounds for Eastern, Ashton Guthrie added two points, while Kennadi Rockhold and Jaymie Basham scored a point apiece. The Lady Falcons won’t get much of a rest, as they host Southern on Saturday afternoon and then head to Belpre for their first of three straight on the road on Thursday. The Lady Eagles have the weekend off and are slated to be back in action on Monday at Meigs. CORRECTION: In a Tuesday, Jan. 16 report, it was incorrectly noted that the Lady Eagles dropped a 77-42 decision to Williamstown on Saturday, when in fact the game was canceled. https://www.mydailytribune.com/wp-content/uploads/sites/42/2019/01/web1_1.19-WAH-Gibbs.jpgWahama sophomore Emma Gibbs (11) drives between Eastern seniors Jess Parker (left) and Kelsey Casto (32), during the Lady Falcons 64-46 victory on Thursday at Gary Clark Court in Mason, W.Va.
https://www.mydailytribune.com/wp-content/uploads/sites/42/2019/01/web1_1.20-EHS-Durst.jpgEastern sophomore Whitney Durst (40) shoots a two-pointer over Lady Falcons Torre VanMatre (3), Harley Roush (24) and Emma Gibbs (11), during the Lady Eagles’ 18-point setback on Thursday in Mason, W.Va.